The announcement by the Confederation of African Football (CAF) that Togo have been suspended from the next two Africa Cup of Nations and fined $50,000 will come as a surprise to many football fans around the world. 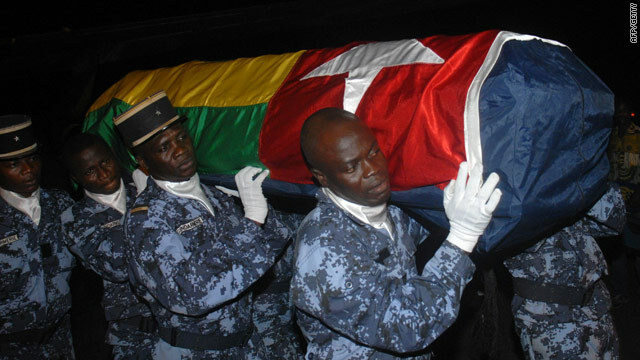 A coffin containing one of the three killed in the terrorist attack returns to Togo. The governing body of the game for the continent of Africa will argue they have merely stuck by the letter of the law. Togolese politicians had no right to call home their national team from participating in the Nations Cup in Angola and by doing so they clearly contravened CAF regulations. The move in CAF's eyes, was contrary to the wishes of captain Emmanuel Adebayor and his teammates to stay and participate; political interference in international football is prohibited, consequently Togo's "Hawks" must pay the price. The mix of politics and football is a particularly thorny issue in Africa, a fact that may explain why CAF have reacted in a seemingly draconian manner, though the organization normally dishing out the discipline is world football's governing body, FIFA. Unlike most national football associations around the world, where large revenues are created through the sale of broadcast rights and merchandise, most federations in Africa rely on the benefit of the state to operate. In the past, this has led to unwarranted government influence when key decisions concerning the running of football were made according to FIFA, and consequently the independence of soccer organizations has been vehemently defended. Ethiopia were prevented from taking part in the qualifying rounds of the 2010 World Cup for such reasons, while Kenya were suspended from international competition as recently as 2006 after their national federation became factionalized along political lines. Nigeria came within a whisker of sanctions during the same period, while Niger suffered a ban in 2004 after "repeated interference from political authorities" in the affairs of the Niger Football Federation forced FIFA to act. This is all well and good, but surely CAF have failed to appreciate the human circumstances behind Togo's failure to fulfill their fixtures. The Togo team may have put themselves in more danger by ignoring CAF advice to fly to the tournament, they may also have warranted ejection from the event when they failed to play their opening match, but how many other national teams have watched three of their party die at the hands of machine-gun wielding attackers? How many teams in history have faced playing a tournament with squad members struggling to recover from gunshot wounds? Whether CAF's choice to ignore the simple and extraordinary facts surrounding Togo's tragic tale will prove a mistake only time will tell, but from a public relations point of view, surely to punish a team that is still reeling from the horror of their ordeal is to rub salt in already bloody wounds. The government,not the sports federation,should be forced to pay the fine,they are the ones who need to be punished here.But not punishing anyone would be a mistake. All the members of CAF should pull their teams in protest. It's stupid to penalize Togo under these circumstances. The decision by the CAF was wrong, wrong, wrong. Despite their statements that they commisserate with the players, their actions do not reflect those sentiments. If anything, instead of a fine, the CAF should be giving a donation from their handsome profits to the team. I wonder, what would they do if the other teams decide to boycott the upcoming games in support for the Togo players? The move by CAF and FIFA is very dumb. The Togolese squad was attacked. Wether one agreed or not with the decision of the national government to withdraw the squad, it was well within the rights of the government to do so in the name of protecting their citizens. I agree that traveling by road in Cabinda was not a wise choice. however, the imposition of suspension and fines is just stupid. This act should be rescinded. This decision is a shame for Africa. CAF is even boasting about the "quality" of the Angola tournament, calling the death of the Togolese squad members a "small incident". If they were not smart enough to prevent the "Cabinda rebellion interference" that caused the death of two people, how can they be bold enough to punish Togo for "governmental interference"? Where are FIFA and Blatter? What if the dead were from Egypt or Côte d'Ivoire ? The "big nations" of African football should require that the decision be repealed. Let "solidarity" not be an empty word, for a change !!! CAF says "Guys soccer is more serious than the lives of the players, we can't break the rules over a few deaths come on!" How can you insult the realtives of the dead people like that. They stay and travel with maximum protection, making them think less about others. Is CAF trying to proove that it is an organised body ? Are they trying to keep themselves busy with the little opportuinity they get? Well mannerd west african in the Togo national team will never go and chase football after this tragedy because we respect and value lives. CAF need to go there and learn that. This is crazzzzzy,CAF i out of mind by making such a decission.being it that Togo was not protected by CAF in Angola,they lost their team members,now this!!!!! This is ridiculous!!!! A Joke!! The REBEL leader said that the gunman were meant to shoot only the Angolan Army guarding them!! The African Football federation should be punished for allowing the game to be played in a war ravaged country and the Angolan football federation should be fined and suspended from hosting any tournaments for failing to protect a team!!! Issa Hayatou and the CAF are proving stupidity is not yet to be rid off this ill fated African continent. How in the world a self respected confederation could come up with such debilitate ruling and decision making. We ought to put down the whole CAF management and rethink a new and contemporary business leaders for soccer sport in Africa. Shame on current CAF and Woe unto its leadership! Should COMMON SENSE and the RULES/LAWS come into direct conflict, COMMON SENSE will always prevail. FIRE ALL THE CAF OFFICIALS...THEIR DECISION IS HEARTLESS, CRUEL AND AN INSULT TO HUMANITY !!!! This is one of the most sickening things I have ever heard. It would be nice if the other African nations boycotted the tournament next year in solidarity with Togo. FIFA should also step in but I am sure this will be another situation that requires leadership from Blatter where he will stick his head in the sand. The CAF authorities are idiots, how could they expect a team to perform after they had witnessed their coach shot dead, and their starting GK fighting for his life. You can see that from this decision the authorities are only interested in money, the person that plays the game is no longer important. I wonder if the CAF authorities would do their job if they saw a very close friend or a family member murdered in cold blood, what would be their reaction if they had just escaped with their life from a similar incident. It is totally unfair, and I think that Togo should fight this decision. It's very surprising that Togo could be handed such a harsh and rashy penatly decision. We are talking about lives lost. Let CAF officials think of loosing loved ones, right before their eyes,not to talk of ambush experience.. Someone should ask CAF if Profits and Face saving superseeds LIVEs and Security. Poor Judgement of course ,from poor Organisers. Togo, the World mourns with you. May the departed find peace with their creator,as others continue to heal their wounds. an absolutely despicable decision by CAF! This decision is senseless and humiliating for the Togolese. No doubt that their withdrawal from the event was due to extraordinary circumstances. The law was rigidly applied but I am sure that this ruthless decision will be revoked as the international sporting community was simply stunned with what happened in Cabinda, even more so now with such a faux pas by CAF. I will say CAF has gone too far. When Nigeria was suspended some years back due to political interference, all hailed CAF. This time around, i think the sledge hammer was dropped too hard on TOGO team. Does that mean if those people that attacked the team, succeeded in attacking majority of the teams participating, the tournament would still went ahead? Angola knew there were rebels in that region, what did they do to prevent such attack. Traveling by road to the venue of there first match is not a sin. Adequate security ought to have been provided This event happen in Angola jurisdiction, which should be save for all the participating teams and everybody that has interest in that competition. We talking about people been killed and CAF still expect them to participate, we are all human beings and our feeling should not be dead because of one draconian law. CAF should be flexible, don't kill Togo football, they are just coming up. Banning them for two years is not called for, because they withdrew not in their own will. Where is FIFA's "Fair Play" policy in all this? Togo were the victims in all this and now they are required to suffer further. FIFA should be considering sanctions against CAF rather than allowing this shameful decision to stand. Number one word -.-.-. let the whole world know what si happening africa where humans have no say. Im sure the rules were placed there to protect from political interference in scores and revenue. Definitely not a case when the government feared for the safety of its citizens. This is akin to making the Israeli team who escaped capture compete in the Olympics while its teammates were being held hostage, and banning and fining them if they didnt. Just another case of a governing body doing exactly the opposite of what should have been. Stupid is as stupid does. And yes what about sanctions on Angola? Seems like I'd punish the broken state where the attacks took place. Stupid.... CAF, is she in denial? Futbol equals money.... All participants should withdraw... FIFA should withdraw the WorldCup on security grounds. This is a political decission. Sepp Blatter, president of FIFA , will not take any action. Blatter rules the FIFA like a dictator of a banana republic. He came to power with the promise of the World championship to the African continent and with the help of those African votes he won the election to Johnansson. Acting against the CAF by him is like comitting political suicide. Indeed a ridiculous move by CAF...at least on moral grounds. But could there be something more rational behind it...like hard cold profits? Lets not forget that Togo's team and individual players are planning to launch major lawsuits agains both CAF and the Angolan Govt. Could the banning of the Togolese team merely be a future bargaining chip or premptive punishment? African business can be a dirty game...only no refs to give out red cards. I am highly dissapointed with CAF...this is a disgraceful decision. The president of african football mister issa hayatou has lost reason . Sometime when you stay longer athe head of the institution is what happen . When it snows the game is postsponed , I don t why when people died they can not postpone? The suspension and fine levied against Togo is a shame on African football and values. CAF has lots its bearings by punishing the Togolese players so severely instead of compensating them for the trauma which they must have been through. They have turned a blind eye to the carelessness within the Angolan organisers who knew that such a threat existed in Cabinda and still insisted on hosting some of the matches there. Nothing is being said about the failure of the hosts to provide adequate security for their guests and their is no visible pressure from CAF or other continental leaders to get justice for the Togolese dead. The implication for the future is that when CAF invites any nation for their competitions in future, the contigent should include their private security personnel and possibly detectives to follow up on any crime commited against the visitors and it would even help if the football kits also includes bullet proof vests or body suits! I don't think the caf president has a human feeling, for someone to lose two human beings and were attacked by gunmen. The psychological effect of the after is very diffcult to overcome, the togo suspension shows lack of human feelings, selfish interest of Caf. I think CAF officials dont have hearts for people who sent them there to earn big salaries while making ridiculous decions which dont reflect African culture of mercy all times when your brother or sister dies. this is the most inhumane treatment on anybody or country. Where else can such judgemement be passed except in Africa my continent. I think the whole team of CAF management should be forced out. How cold and uncaring can you be? i am sure you would have been more smypathetic if this had befallen your country. FIFA please step in and shame these monsters with hearts of stone.. MAY gOD FORGIVE YOU ALL. Most of people who are taking position for this stupid decision don’t understand at all the context. Togolese team took an airplane to Congo to camp there for few days training. The trip from there to Cabinda is about an hour and half by bus. They are using CAF bus escorted by Angola police. CAF should be sued and staff should be banned and compensation due to the victims family and apologizes to Togolese FA. This decision by th CAF doesn't even make sense. A game that is played by humans. one can no longer play this game. How does the CAF expect a TOGO to play at their best while they mourn their dead and at the same time deal with post-traumatic stress from this guerrilla attack? Surely this decision is meant to divert attention from the bungled security by the ANGOLAN GOVERMENT. TELL ME THAT IT'S SIMPLY A JOKE FROM CAF; EVEN IF IT IS THE CASE, THAT IS A BIG SHAME, A STUPID DECISOIN . HOW CAN CAF BE SO RIDICULOUS BY PUTTING " OIL ON FIRE"
SINCERELY I THINK THE LOST REASON FROM THE ITEAM OF CAF IS A MATTER OF IRRESPONSIBILITY. IT IS TIME FOR THEM ( BEGINING FROM THE PRESIDENT ISSA HAYATOU ) TO RESIGN BECAUSE NOT ONLY THEY FAILED IN " SECURITY " BUT ALSO THEY ARE UNABLE TO MANAGE THIS PROBLEM. What do you expect from Africa? There is no logic, please!! CAF should be fined – they never warned teams of their political unrest in Cabinda. So Stupid!! I think it is a very foolish idea to suspend Togo from two cup of nations,because of the killing of their fallow team mates.Togo lost three players in an armbush ,it is not like they decided to kill themselves or anything like that.The president of CAF and his leadership should be suspended because they very STUPID to think that the TOGOLESE are going to Play while they while is stupid. At this point we should be congratulating Egypt on their championship. Instead it is overshadowed by this CAF ruling. Lets hope the Nations Cup can survive and go forward under new leadership. issa Hayatou should resign for a more intelligent and wise person to take over African football. he has no conscience. Issa Hayatou is just plain stupid, foolish, brainless, and less than an animal. What if ALL other African countries boycott the games for the next two seasons? Do we have an umpire? FIFA?? Are you listening Blatter? Or are you bird of a feather? Mr Hayatou MUST be removed, and nothing short of this will appease the souls of the departed Togolese players. Angolan government MUST be made to pay compensation to the families of the killed players. that all this happened with the world cup just about to kick off brings to fore the issue of caf's (in)ability to manage african soccer.not only was the security wanting;facilities for the visitin teams were ill adequate and the officiatin of matches ridiculous at best! so togo was banned as per sec 78 of the nations cup regulations and i want to believe issa and his team had a little more time to read down to 80 that allows for teams to exit under circumstances of force majeure. does issa assume that death is such a light issue?togo may have stayed,possibly lift the cup but the memory of their loss would still loom like a dark shadow over the trophy. to issa,20-odd years is enough for you at caf.the dust from the lush carpet in your executive office has found its way up your system n clouded ur judgement. What a shame,than mourning with them CAF is slamming Togo FA n Team,i wish all African national teams could learn from this and protest together , without no teams no CAF, there should be a union meant for African players as well in which their voices could be heard, we are talking of human souls that got killed because of a a CAF competition, i pray the Togo FA should sue CAF as well for wrongful dismiss , i wonder if it has been the Cameroonian team , if Hayatou and his co hort will have done this..Africa Arise ..
Hmm,that was a wrong decission by CAF,although the Togoless was wrong by pulling out of the competition but the penalty dosnt worth it. If the armed robbers are from Angola the host nation,what was their punishment? I don't really know or understand how the executives of CAF are making their decisions but I'm so disappointed by their latest decision to band Togo from competitions it is unimaginable , what will the president of CAF do if he was in the shoes of the Togolese FA? Football is all about uniting people, nations and etc and our leaders should set a brilliant example for the future generations. It is not a decision that is beneficial to African Football and it's a decision that does not show much empathy or common sense. Togo should sue Angola for such an ill conceived idea i.e. staging matches in Cabinda an area synonymous with armed hostilities for many years. All Africans should boycott matches this is just plain daft!!! I'm curious about the enforceability of the CAF ruling. What happens if the Togolese government refuses to pay the fine, money that is better spent compensating the families of the two whose lives where lost in the name of football? Absolutely ridiculous. The rules under which such punishment was meted out to Togo, have been conceived by apparently sensible people. Their application is therefore expected to be sensible.In this instance that has not been the case. To expect Togo to deliver a normal performance after undergoing the horror they experienced would have been unreasonable. To punish them for withdrawing beggars belief. The way my people reason sometimes are very shallow, Togo holocaust in Angola 2010 will forever be in record.I can assure you if this had happened in advance country the bereave are in money. Many have contributed with all being sympathetic towards Togo. I woiuls think the next line of action (proabably part of social responsibility) is for CNN to go and interview CAF management ( or is it better to call them CAF damagement). Lay bare the thoughts and minds of Africans to CAF and let them speak and not be ashmed to apologize. CAF may be wrong granted. But if you come from Afirca you will know that part of the problem was Togo's who paid a very heafty price for a bad decision. In Africa presidents have power to stop anything. The Togolese president should have consulted the team he did not. They pay for having him as their leader. When the trafic police revokes the driving licence of an overspeeding taxi man it means that his family that were not in the vehicle at the time will suffer after he looses his Job. What should the police do? Think of the family or the road users? Either way some one will fill the bit of the law. The law is not fair but it is there to be read and kept. I am so sorry togo you are at the end of a bad law and a bad government. The CAF decision on Togo is baseless, inhuman, unrealistic to mankind, if the CAF family are among the dead what will be there reaction? This is outrageous decision by CAF. How can you expect a team to play while three of their members are shot to death? The Togolese national team should have been comforted. The host nation should have apologized officially and prepared memorial services. Actually I am not surprised by CAF’s decision to ban Togo, but I am ashamed to realize that such unjust decisions have infiltrated our beloved sport. I strongly oppose that huge fine imposed on them. Humans are created in the image of God,some of the qualities of God is love and wisdom,it will also to be nice for us to portray these qualities by being wise in our decision and also show that we love our neighbours. The decision makers should always think first that they also have relatives. I 'm very much aprreciative of Togo's government reaction which is very human and responsible. Please don't put sport before life. I agree 100% with CAF for the suspension and fine. In this mordern age, being ignorant of the fact is no excuse. Togo knew that Angola had been at war for God knows how long and they were told to go by air. The team took a plane from Togo to Congo for few days camping and training. Then they took a CAF bus from Congo to Cabinda for 1H30 trip. The team was escorted by Angola police when they were attacked. You don’t organize a tournament in a country which is not secure and CAF knew it. You reminded me of my cousin who went to China to study medicine for seven years. On his return to Sierra Leone the shortest way to get to the capital city Freetown from the airport was by ferry and they were not that many. With my excitement to have picked up my cousin from the airport I attempted to talked him into boarding a canoe after we learnt that the last ferry (we thought) had just left for the city. Fortunately my cousin told me that he was not going to risk his life on a canoe across a tributary of the Atlantic Ocean. The fact of the matter is that you weigh the pros and cons and you make the best possible judgment at the time. I THINK THAT FIFA NEEDS TO BE SERIOUS AND STOP THIS HYPOCRACY IT CAN HAPPEN TO ANY EUROPEAN TEAM. WHY THIS BEHAVOIUR? Well am my self was awaiting the action of the CAF, since it was taking too long, beside i think our Governing body is being Discriminating Here, First Not even a Condolence Massage to the beloved family of the african Follen young stars, secondly the Punishment is just too hash, beside will it have a political repercussion of instead it will be felt on the Tradition of the sport,? i think CAF has to reconsider a fine without a BAN is eminant but not both. Then the conduct of the Egyptian Football team and their Federation gose without being Questioned by CAF isn't that Politics now??? We (the whole world) are still waiting for CAF to apologize for that decision and call off the ban and fine. When people become callous, this is what we get to see; jungle justice. What a shame...Isa must repent and ask Togo for forgiveness. Fifa should prevail on CAF and the CAF President Mr Isa. It is not the first time that death has accompanied football. In most of the previous cases that immediately come to mind (Hillsborough, Heysel) the game went on. Admittedly Togo was a terror attack and not crown violence, it is necessary to continue with the games to minimise the impact of such incidents. We cannot have a situation where any violent agenda is allowed to throw games into disarray. Terror cannot be allowed to win! the game. how are they going to get them selfe the pitch . please CAF should revoke the punishment because this shows that togo has lost in so many places.Recoding of three members death and being suspended for two nations cup. This is not fair. Caf discision is not right let them but themselfs in the shoes of those players that survived to say will they have the mine to go ahead and play when there coleaques are in the matuary OR will they not calloff the competition if it were their country that were involved it that tragic event. CAF President please have a human face FIFA please say something. The whole world is behind Togo. A very shameful decision, especially when it was the CAF President himself that advised the team to feel free to decide if they cant go ahead with competition. Really, the CAF officials have acted against the very thing the game is all about- Fair play. I hope this will be a lesson to the entire football organisations in the continent,they should put the welfare of their flag bearers at the front burner and not risk their lives for the sake of saving money. What will you expect from CAF? the entire sports governing bodies in world are run by dictators or how will you explain the rationel behind their democracy that has no terms limit for selected(elected) leaders?. CAF is not serious with this decision, they are telling us that CAF valve gain from the match than the players. CAF! CAF!! CAF!!!. How many time did l call u Guys on this issue. Be careful CAF president. I am Togolese, and I would like to thank all the comments from my beloved Africans who, through their sound, logical comments sympathized my countrymen. Others like Peter, who knows it all, is sitting behind his free computer somewhere shooting nonsense. I hope and pray nobody from your country, family or neighborhood is gunned down over an antiquated war that has nothing to do with football. Togo, and African football will survive. Review the facts. Togo football team is attacked by armed robbers in Angola. A Togo football player dies from gunshot. Angola is humiliated on the international stage. Let Togo play and try to forget the humiliation of Angola. OTHER AFRICAN FOOTBALL FEDRATIONS SHOULD UNITE AND TELL CAF THAT 'ENOUGH IS ENOUGH' IF THEY CANNOT GET THEM REVERSE THE HEARTLESS SANCTION, THEN THEY(CAF) SHOULD CONSIDER ALL OF THEM EQUALLY SUSPENDED. An utterly heartless and cynical action that puts kicking a ball into the back of a net ahead of the dignity of a human life. Togo should withdraw from the African Cup for an additional year to demonstrate their contempt for the CAF. I hope that the rest of the African nations rise up in protest and boycott next year's cup in solidarity. I can't read worldsportblogs.chn.com in Szfari 7.2,I justy fogured I would tell you about it. That is the mentality of CAF they are bunch of idiots leading africa. Angola should not have been given the hosting right in the first place, is like they dont know the physcological effect to see a love one gunned down in your present. CAF have just lost their heads and have become a a group of brainless idiots. It too painful. CAF leaders should be asked by the Togolese Gogernment to pay for the damages, That is,the loss of life and other damages caused by the incident. Why?, Because it was CAF bus that transported the players to Angola. CAF should have insisted that the Togolese players fly instead of going by road since it is a war torned country.But becasue CAF wanted the money from the bus rental they decided that it was okay for the players to go by road. It is plain and simple.Banning the team itself and fine imposed is complete nonsense by CAF. After all CAF members are not " FOOTBALL GOD"
NO COUNTRY CAN ALLOW THEIR TEAM TO STAY BACK.MR CAF IT IT WERE YOUR FAMILY THAT WERE INVOLVED LIVING FEW PEOPLE WOULD YOU HAVE ALLOWED THEM TO STAY.EVEN US CAN NEVER ALLOW THEIR TEAM TO STAY BECAUSE ANGOLA FAILED IN SECURITY.